Overlooking the scenic Ashley River, The Bristol is the only luxury condominium residence on the Charleston peninsula providing direct access to a full marina. Just as important, it's the ideal home for those who insist on high-quality amenities but still want the place they live to feel casual, cozy and inviting. In addition to magnificent views of the Ashley, Bristol residents can look out their windows to the Charleston skyline, the marina and Brittlebank Park next door. From their boat slips, it is just a few minutes to Charleston's international harbor and the nearby Intracoastal Waterway. 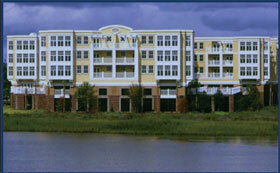 The Bristol consists of only 54 units but offers nine distinct floor plans. Two- and three-bedroom configurations range from 1,468 square feet to 2,331 square feet, and most homes include hardwood floors, granite countertops, stainless steel appliances and gas fireplaces. And in a city where parking is always at a premium, residents of The Bristol are deeded two garage spaces per condo. Potential homeowners who need additional reasons to take a look at The Bristol should consider its central location and its 24-hour security staff. But The Bristol's most enchanting drawing card is that it is a comforting place to enjoy life in beautiful Charleston, South Carolina - relaxing in the sauna, enjoying a dip in the pool or simply interacting with friends and neighbors. "Bask in the morning sun while drinking your coffee or gaze at the sunset while working out in the gym. From morning until night, there is never a dull moment," says Marilynn Durkee of AgentOwned Real Estate. "Whether you choose to go it alone or join your neighbors for fun, life at one of Charleston's most exclusive addresses is delightful."